SOURCE: DEPARTMENT OF HEALTH – From 1 August 2017, new nursing, midwifery and allied health students will no longer receive NHS bursaries. Instead, they will have access to the same student loans system as other students. We are carrying out a consultation on how we can successfully implement the changes outlined below. It will ensure there are enough health professionals for the NHS while reducing the current reliance on expensive agency staff. This will enable universities to provide up to 10,000 additional nursing, midwifery and allied health training places by 2020, so more applicants will have the chance to become a health professional. The change will only affect new students starting their courses from 1 August 2017. There will be no changes for those students already studying and in receipt of an NHS bursary who started their courses before 1 August 2017. Students who accept a place for 2016 but defer and commence their courses after 1 August 2017 will be funded on the standard student support system. 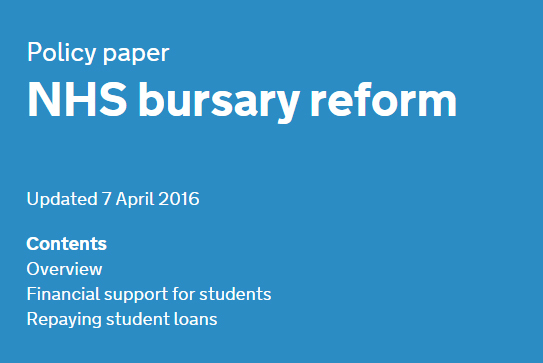 Existing students that start before 1 August 2017 who subsequently temporarily suspend their studies will remain on the NHS bursary scheme for the full duration of their course and won’t be transferred onto the standard student support system. For healthcare courses outside the remit of the reforms, the government is working with Health Education England (HEE) and other delivery organisations to consider the delivery models and funding options for these programmes. The government, through HEE, will retain the responsibility for commissioning and funding the minimum numbers of clinical placements required to provide sufficient healthcare graduates. Under the loans system, students on nursing, midwifery and allied health courses will typically receive around 25% more in the financial resources available to them for living costs than at present. The precise change for individuals will depend on their circumstances – for example, where they study, the length of the course, income and residency. We intend that students studying nursing, midwifery and the allied health subjects as a second degree will also be able to get student loans. To support students who are planning to undertake nursing, midwifery and allied health professional subjects as a second degree, the government will put in place an exemption to enable these students to access the standard student support system, just like students studying for a first degree. The entry rate to higher education for students from disadvantaged backgrounds (the proportion of 18 year olds who are accepted for entry) is at record levels. The consultation considers how we can support students from all backgrounds to ensure they can continue to pursue health careers. Repayment terms are the same as for other students who have taken out a student loan at university. Graduates become eligible to pay back their loans in the April after they graduate, and then they will have to pay back only 9% of their earnings over £21,000 per year. For example a newly qualified nurse earning £21,700 would pay back £5.25 per month. If income drops below £21,000 for any reason, for example because of part-time working or a career break, repayments stop. Any amount not paid back after 30 years is written off by the government. Students who undertake nursing, midwifery and allied health professional subjects as a second degree will only be required to make repayments on the second loan once the balance of the first loan has been repaid.